Andy: Drinking this straight is very rough. Actually straight it is piercingly disgusting. It’s definitely rich but I don’t know where Adrian is getting the fruitiness from. It isn’t too bad mixed with Coke Zero though, as the soda takes some of the bite out. I actually taste a little cinnamon in it now. Adrian: Ron Matusalem has a major bite up front, but once you get passed the bite, it has a rich and fruity flavor. It’s excellent mixed with Coke Zero. The strong rich and fruity flavors really stand out. This RUM has mixed reviews so I decided to buy a bottle and give it a try. I respect the opinions of Andy and Adrian but found this RUM incredible ! Wonderful sipping RUM , no ice straight. I dunno how it is mixed with cola or anything else ……….. the bottle is empty and I never diluted it and gotta buy more. 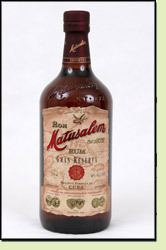 Love your reviews, but I don’t agree on this one – I love me some Matusalem and find it quite smooth (though expensive in Australia @ A$65 a bottle). Oh well, not to worry, I’ll keep reading anyway. First time I tried this was straight on ice. Was impressed as it seemed good quality vs price and no burn but wasn’t my thing. Something funky in that the molasses flavour was too pronounced. Figured it’d make a nice Witch Doctor. Second time I just wanted a quick shot of something w/o burn. Was incredible. Flavours came out that the ice kept hidden. Tried a larger glass I use for sipping, no ice. Yup, ice holds the best of it back and allows other flavours to compliment the molasses. TL;DR. Give this a try in other ways. I didn’t love it at first. Now it sits by Mt. Gay Extra Old and will always be in my cabinet.